Getting the most out of your investment in Business Contact Manager for Outlook takes a bit of practice, but thousands of users have found that the time is well spent. This article will familiarize you with the features and options of Business Contact Manager for Outlook. Each section includes one or more links to more detailed articles that will help you learn more about a feature and complete a set of tasks. In the Navigation Pane, under Business Contact Manager. 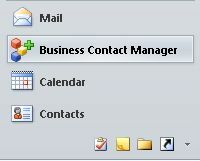 Tip: Click the Business Contact Manager folder to display the Business Contact Manager Dashboard. In the Navigation Pane, click the Business Contact Manager or Solutions button. 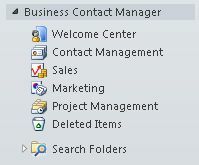 In this view, the Business Records folder is displayed under the Business Contact Manager folder, in addition to the Welcome Center, Contact Management, Sales, Marketing, Project Management, and Deleted Items folders. Note: Search Folders are not displayed in this view. Additional features and options are found in the Backstage view, on the Business Contact Manager tab. For more information about these, see Set Business Contact Manager options and use features in the Backstage view. Tip: If you don't see Business Contact Manager, it might not be installed, or it has been disabled for your profile. Each folder that is underneath the Business Contact Manager folder represents a different view of your business data. Take a minute to open the folders and familiarize yourself with the views. Tip: If you haven't already added your own business data, try using the sample business database. Click the File tab. Click the Business Contact Manager tab. Click Manage Databases, and then click Switch to Sample Business. 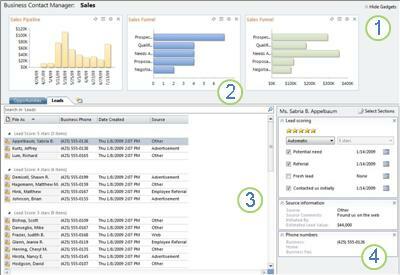 The Business Contact Manager Dashboard. View up-to-the-minute information about your business in the gadgets. Gadgets graphically display information from the various records of Business Contact Manager for your analysis. For information about the Dashboard, see Track important business details on the Dashboardlater in this article. For information about gadgets, see Use gadgets in Business Contact Manager. An overview of Business Contact Manager for Outlook features and introductory videos. For more information about the Welcome Center, see Learn about Business Contact Manager in the Welcome Center later in this article. Store information about your Accounts in Business Contact Manager. Use Business Contacts in Business Contact Manager. Manage your potential customers or leads in Business Contact Manager. The Sales workspace which gives you quick access to your Opportunity and Lead records. Use the records to review your potential sales and customers. The gadgets display up-to-the-minute sales information. For information about Opportunities and Leads, see Track potential sales opportunities in Business Contact Manager and Manage your potential customers or leads in Business Contact Manager. The Marketing workspace to plan and view the marketing activities that promote your business. The gadgets display information about your marketing activities. For information about the Marketing workspace, see Market your products and services in Business Contact Manager. The Project Management workspace. Keep up with your Business Projects and their related tasks. For information about Business Projects, see Organize business projects in Business Contact Manager. The Deleted Items folder holds records deleted from Business Contact Manager for Outlook, and can only be emptied by the owner of the Business Contact Manager database. For information about the Deleted Items folder, see Delete Business Contasdfgct Manager records. Folders, such as Business Leads, that list the records that match the criteria that you specify. Search Folders are automatically updated. For information about Search Folders, see Search your records in Business Contact Manager. For more information about the workspaces, see Master your Business Contact Manager workspaces. To open the Business Records folder, in the Navigation Pane, click the Business Contact Manager or Solutions button, and then click Business Records. The Business Records folder contains folders that display a list of each type of record: Accounts; Business Contacts; Opportunities; Marketing Activities; Business Projects and Project Tasks; and Communication History items. Note: Leads are included in the Business Contacts folder because they are a type of Business Contact. The Accounts, Business Contacts, Opportunities, Marketing Activities, Business Projects, and Projects Tasks, and Communication History folders that display lists of the records of the selected type. Note: Lead records are included in the Business Contacts folder because they are a type of Business Contact. A list of all Accounts, and any records that are based on the Account record type. View, edit, or add new Accounts and Account record types to this list. For more information about Accounts see Store information about your Accounts in Business Contact Manager. A list of all Business Contacts, Leads, and any records that are based on the Business Contact record type. View, edit, or add new Business Contacts, and Business Contact record types to this list. For more information about Business Contacts, see Use Business Contacts in Business Contact Manager. A list of all Opportunities. View, edit, or add new Opportunities to this complete list. For more information about Opportunities, see Track potential sales opportunities in Business Contact Manager. A list of all marketing activities such as call lists and mass e-mail campaigns. Create, view, or edit any marketing activity. For more information about marketing activities, see Market your products and services in Business Contact Manager. A list of all Business Projects. Create, view, or edit a Business Project. Click the Project Tasks folder to view the related tasks. A list of all Project Tasks. Create and link Project Tasks to Business Projects, and view or edit Project Tasks. For information about Project Tasks, see Use project tasks in Business Contact Manager. A list of all communication history items, such as Opportunities, Business Projects, e-mail messages, appointments, and meetings. View and edit any item, e-mail message, or file. You can also create a new item and link it to a record. For more information about communication history, see Track your communications with customers in Business Contact Manager. The Deleted Items folder holds records deleted from Business Contact Manager for Outlook, and can only be emptied by the owner of the Business Contact Manager database. For information about the Deleted Items folder, see Delete Business Contact Manager records. Once you complete the Startup Wizard, the Welcome Center opens. Use it to find a wealth of introductory information about Business Contact Manager for Outlook. Click a category on the wheel to see a brief description about that area. Watch a short video for an overview of how you can use Business Contact Manager for Outlook to help you keep track of your business information. Or, click one of the Getting Started cards in the lower half of the Welcome Center for more details, videos, and links to articles about the features that interest you. Use the arrows to scroll through the cards. You can return to the Welcome Center any time you like. Just click the Welcome Center folder in the Navigation Pane under Business Contact Manager. With just a glance at the gadgets on the Dashboard in Business Contact Manager for Outlook, you can see your business's earnings potential, the current and future workload on staff, and which marketing activities are producing results for your business. The Dashboard can display up to 20 gadgets charting the sales, marketing activities, projects, and tasks of your business. Use the Ribbon to add the gadgets that you want to see on the Dashboard. Drag the gadgets to rearrange them, or click the View tab on the Ribbon to add or remove columns from the Dashboard. It's your view to customize. Each Business Contact Manager for Outlook workspace includes a gadgets area and section for tabs. The commands are slightly different for each of the workspaces. Generally, they each include commands that enable you to create new records, edit them, and set up some kind of communication, such as send an e-mail message. 1. In the gadgets area, display key business metrics in charts and graphs to get a quick view of the state of your business. You can show or hide the gadgets area as well as add or remove gadgets. For more information about gadgets, see Use gadgets in Business Contact Manager. 2. In the tabs area, you can manage, review, and analyze your business data. Each tab is comprised of a list of records, and a Reading or Preview Pane. The Reading Pane displays information from sections in a selected record. 3. The tabs list the records that you want to see, such as the Opportunities or Leads records shown. You can add a tab for any record type to any workspace by clicking the Create New Tab button. 4. In the Reading or Preview Pane, you can view selected sections from an individual record. To change the sections that are included, click Select Sections. For more information about the Reading Pane, see Master your Business Contact Manager workspaces. To change settings for some features, or perform tasks such as sharing or backing up your database, importing or exporting data, or get Help from newsgroups or other users, go to the Backstage view. To perform a task. such as sharing the database, that affects all of Business Contact Manager, click one of the buttons. To get help from Microsoft or from the Business Contact Manager community, under Getting Help, click one of the options. For more information about the options in the Backstage view, see Set options and use features in the Backstage view. We've come a long way from the Rolodex®. Today, your business records contain a rich set of searchable data that can be of immense help in running your business. Plus, the tools in Business Contact Manager for Outlook go even farther because you can use them to visualize your data in gadgets, reports, and charts, and take the data with you to help you be more productive when you're out of the office. Searching your business records is a quick way to find a single record or group of records. Your 10 most recent search strings are automatically saved for easy re-use. For more information about searching, see Search your records in Business Contact Manager. Applying a filter to a set of data or records allows you to display only information that meets a specified criteria. Filters make it easy to retrieve a single record or a set of records that have common characteristics. Filtering a list or report is a great way to produce a lists for a marketing activity, sales calls, or other business activity. For more information about filtering your records, see Filter records in Business Contact Manager. In Business Contact Manager for Outlook, gadgets display key business metrics and information on your Dashboard or the Contact Management, Sales, Marketing, and Project Management workspaces. For more information about gadgets, see Use gadgets in Business Contact Manager. A report is an excellent tool for gaining insight into your Accounts, Business Contacts, Leads, Opportunities, Business Projects, and marketing activities. You can open more than 60 standard reports in Business Contact Manager for Outlook, and can also modify, save, update, and reuse an almost unlimited number of additional reports. For more information about creating reports and charts, see Use reports and charts in Business Contact Manager. You can export your business records and use them in other programs, such as Microsoft Excel. For example, you may want to export a copy of the data in a single report to Excel for deeper analysis. To learn more about exporting your business records, see Export your business records from Business Contact Manager. You can take your business data with you when you leave the office: on your laptop, or on your phone. You can also access Business Contacts by signing in to Outlook Web Access if you have turned on the Business Contact Synchronization feature. For information about taking your business data with on your laptop, see Work offline using Business Contact Manager.For information about including Business Contacts on your phone or accessing them on the web, see Access your Business Contacts remotely: Use Synchronization in Business Contact Manager.